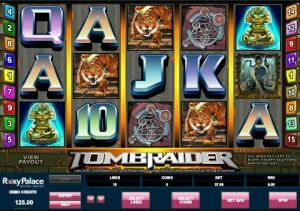 Tomb Raider Secrets of the Sword is a game powered by Microgaming and is the most recent addition to the Tomb Raider themed slot games on offer by Microgaming. Needless to say the Tomb Raider franchise has now penetrated pretty much all industries. For those of you who aren’t aware, Tomb Raider is an attractive woman from wealth who, played by Angelina Jolie in the movies, has a similar level of infatuation for both toys and gadgets and adventures. The game, a massive improvement on the former Tomb Raider game, will greet players with all new graphics and game play options, adding to the excellent experience that is on offer here. The only slight stumbling point is the sound effects, which can become a bit annoying, especially if you aren’t doing very well. With 5 reels and 30 winning paylines Tomb Raider Secret of the Sword doesn’t have the most winning combinations of any game, but it does make up for it with in game features. For example, Wild symbols appear randomly on your reels, increasing your chances of winning but then on top of this, Super Mode will be randomly activated and gift you 5 free spins all while those wild symbols remain on your reels. Win. 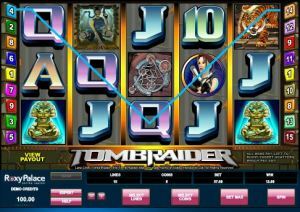 The scatter symbol in this Tomb Raider instalment is the Excalibur sword and the appearance of three or more of these symbols will result in 10 free spins and a good chance of winning some serious money, especially when you realise that each consecutive winning spin results in a bigger multiplier. Probably the most exciting feature of this game is the Global Adventure Bonus feature which is activated by getting the passport symbol on the middle of each of the five reels. Once this mode is activated you will select where you want to start looking for missing pieces of sword fragments, either in London, Bolivia, Nepal, Ghana or Tokyo and once in each of these locations you have the opportunity to win random cash prizes as well as various multipliers and free spins or hidden treasure which if selected means you can progress onto a further bonus round, the Shootout Bonus feature. Here you will essentially play a game of highest card wins and a further sword fragment can be won. At the time of writing, there is no dedicated mobile version of the game – most likely because it is a fairly new offering. You can still play the regular online version in the browser of your phone or tablet, however. This slot is available at, among others, Thrills, Casino Room and Leo Vegas. Packed to the rafters with features, Tomb Raider Secret of the Sword is a game that a Tomb raider fan, or someone who couldn’t care less about Lara Croft’s globetrotting, will absolutely love. With a wide range of stakes available, from 30 pence to 6 pounds, anyone can find a bet they are happy with and take advantage of the generous payouts available from Microgaming on this one.